On Friday night the EPR department and the Year 10 JAC Team (Justice, Awareness, Charity) hosted ‘Night at the Movies’ for Year 7 pupils. 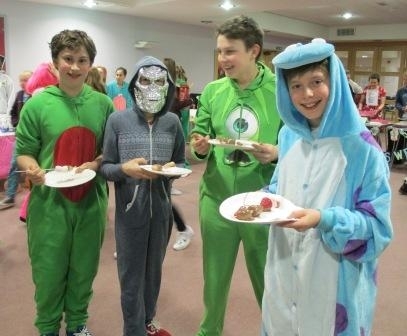 The evening began after school in the Sixth Form common room where pupils tucked into a party tea of pizza and nibbles. Returning to classrooms to change into their themed costumes for the night, Year 7 then came parading in fancy attire to the theatre where a red carpet welcome and screaming Year 10 ‘fans’ greeted them. The movie ‘Monsters Inc. University’ was thoroughly enjoyed by the boys and girls and had given great inspiration for some grizzly, groovy outfits. The interval was one with a difference-the common room was filled with JAC Team stalls selling delectable treats including candy floss, a chocolate fountain and lots of sweets. Excitement and buzz filling the room-some Year 7s commented that they had ‘loved’ the night and Year 10s filled with a sense of achievement said they had thoroughly enjoyed being the hosts. The night ended with some lively dancing and disco entertainment to round the extravaganza off. The JAC Team had been planning this event since the Autumn term and their sense of responsibility and good organisation made the night a great success which they’re proud of. Miss Collins would like to thank them for their great efforts! Money raised at this charity event will be donated to ‘Help for Heroes’ and another charity which will be chosen by the winning Year 7 group of the charity presentation competition, currently being covered in EPR lessons.